When you are in the kitchen, the world is your oyster, the dish your ship and you are the mighty captain. What a captain certainly needs is his sidearm which comes in the form of the various knives a chef must have. You may have your regular chef knives with you, but a true grillmaster you just need to check out all the best butcher knives featured below. Following on the guide that we worked on for you for the best sushi and sashimi knives, here is another helpful guide for you to pick and choose the best butcher knives that can be used for boning, chopping, cutting, etc. For some great advice, tips and tricks and the top 9 butcher knives, just keep reading. There is more than one kind of butcher knife out in the culinary market at every chef’s disposal. Therefore, knowing about these types of butcher knives and their uses should essentially be the first step in your selection process. When you have the best meat for your barbecue, you surely must have the best butcher knife as well. ​Most of the butcher knives available today are the scimitar knife or the classic knife which has been in use for over 200 years. They have been modeled on century old swords and have a characteristically curved tip. Small butcher knives are best for deboning and filleting small portions of meat. ​The cleaver butcher knife is one which is used for chopping and cutting through the bones of bigger portions of meat. They are sturdy and much sharper than the classic knives and chef knives. A curved blade is common to most butcher knives which help cut through thick portions and cuts of meat. While buying the best butcher knife, there are some key attributes, criteria, and points you must look for. Firstly, the blade of the knife should be made out of carbon steel, preferably. This ensures sturdiness and a sharper edge while cutting through those meats. Carbon steel blades can cut through the toughest cartilage and are also thicker and stronger than other knife blades. Make sure that the blade size and handle dimensions are apt for the size of your hand since you are the ultimate consumer. Make sure you invest in a properly designed and sized butcher knife that makes your work easier and does not lead to a hard time balancing the weight of the blade. Another important factor is to look for a butcher or cleaver knife that is not stamped, rather, is forged. Forged blades are crafted out of a single piece of metal and have more resilience, whereas, stamped butcher knives are made by pressing together several layers of metal, which does not yield the same strength. ​For more tips and hacks on how to choose and use your next butcher knife, check out the video below. If you are a newbie butcher or just are looking for a way to challenge your kitchen skills, try out this guide on how to butcher a chicken. It will definitely help you gain some very useful insights. ​After going through the characteristics of a best butcher knife, it is also good to know how to sharpen one. In the video below, you will get to see the right proper technique on sharpening a cleaver featuring the Dalstrong Cleaver - Gladiator Series. Let’s have a look at the top 3 best butcher knives. The Imarku Butcher Knife takes care of all your cooking methods, be it slicing, chopping, dicing, shredding, or mincing. It is the perfect multi-utility knife which can be used for working with veggies in your kitchen as well. The blade is composed of stainless steel which offers long lasting protection and resilience while being exceptionally easy to use and care for. The sharpness is vouched for given that the blade is made from 100% chromium and is easy to maintain and cut with. The handle of this butcher knife is made of Pakka wood, which is not only ergonomic but also versatile, of superior quality and comfortable to grip. A small hole in the corner of the blade is provided for easy storage. The blade measures 7 inches in length and is not recommended to be put into a dishwasher for washing. Imarku offers a lifelong warranty on this cleaver butcher knife which has been designed to withstand years of use and abuse. They also offer a money back guarantee if you do not like the product. Overall, the knife is well balanced, razor sharp, and honestly the best butcher knife out there. Its cleaver design makes it stand out and its stylish edge will definitely appeal to you. Dalstrong is a renowned name in the chef world and they are back with this stunningly designed and incredibly performing butcher knife that will make you feel like a gladiator, just like the name of their new knife series. The Dalstrong butcher knife is versatile and fit for a range of cooking preparations. The blade is extremely sharp and crafted from high-grade German carbon steel which has been built keeping busy kitchens in mind. This knife is the perfect culmination of cutting edge technology and premium craftsmanship. The handle is made out of black Spanish pakka wood and has 3 tangs for better rigidity and grip. The cleaver blade is all of 7 inches in length and is super sharp, heat and wear resistant and forged with extreme precision. The blade is hand polished for a superb satin finish and the handle is triple riveted for highest longevity and durability. The best part of this intricately finished butcher knife is that it is surprisingly easy to clean and low maintenance. Dalstrong provides a lifelong warranty against any defects and you also get a money back guarantee in case of any issues. The hardness and flexibility it provides are amazing when you look at the lightness of this knife that weighs just about 2 pounds. This is what makes the Dalstrong cleaver number 2 on our best butcher knife list. Henckels has designed this classic butcher cleaver knife keeping comfort, sharpness, and style in mind. The 6-inch high-grade blade is made of forged German stainless steel with high carbon content. This butcher knife is one of the best in its class and has garnered some rave reviews on the grounds of its stain resistance, angled cuts, and easiness of chopping those tough meat bones and joints. The handle has 3 rivets and full tang and is dishwasher safe, although hand washing the blade with a gentle soap is recommended. This butcher knife is best suited for preparing bite-sized chunks of duck, chicken and almost any kind of poultry meat. The hole provided in the blade allows you to hang it on a peg easily. This cleaver is the lightest butcher knife thus far; this one weighs a mere 1 pound, definitely easy on your hands! This butcher knife is everything you would expect from a Henckels blade and more. It is razor sharp and nothing comes between its long lasting edginess and once you use this one, you won’t go back. The knife is perfect for even cutting vegetables and chopping up those herbs and leaves in Chiffonade style. The Henckels is one of the most highly recommended and rightfully deserves a top spot on our best butcher knife list. 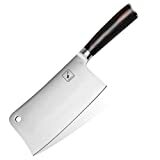 We go through hundreds of products listing at Amazon and also study the ratings left by previous buyers to find the best butcher knives for you. Besides that, we also calculate the overall n﻿﻿et ﻿c﻿﻿ustomer﻿﻿ satisfaction (NCS) grade because we want to see how happy is the previous buyers with their purchase of the product. From our finding, we can say that iMarku, Dalstrong and JA Henckels are the best butcher knife or cleaver brands. These brands are popular and received many excellent ratings for their products. Also, the iMarku Cleaver Butcher Knife, Dalstrong Cleaver Gladiator Series and J.A. Henckels Classic Cleaver score favorably for the ratings as well as the NCS grade compare to the rest. We believe that you would find these butcher knives a good buy too. Well, after this long list we can certainly vouch for the Dalstrong, Imarku and Henckels cleaver knives to be some of the best butcher knives. They are durable, reliable, sturdy, sharp and most importantly very easy to care for and use. You will love the easy functionality these butcher knives provide while being really handy and light on the chopping and cutting front. Hope you found this article useful! Stay tuned for more helpful guides. The post Best Butcher Knives Quick Guide and Reviews (Also, ft. 9 Best Meat Cleavers) appeared first on Gordan Ladd's Kitchen. I've been the cooking for my family since 2009, and my passion for cooking grew stronger each day. Whenever I have time, I love to blog about my culinary experiences and how my kitchen has trained me to become a better chef for my family and friends.